The U.S. National Educational Technology Plan recommends the need to have a common set of technology competencies specifically for teacher educators who prepare teacher candidates to teach with technology (U.S. Department of Education, Office of Educational Technology, 2017). This study facilitated the co-creation of the Teacher Educator Technology Competencies (TETCs). The TETCs define the competencies (knowledge, skills, and attitudes) all teacher educators need in order to support teacher candidates as they prepare to become technology-using teachers. The TETCs shed light on the roles and responsibilities of teacher educators who address technology within their courses. A highly collaborative research approach was used to develop the TETCs which involved the crowdsourcing of technology-related literature, a Delphi method for expert feedback, and an open call for public comment. As a result, 12 competencies with related criteria were identified. The TETCs should be viewed as a first step in a larger reform effort to better address technology integration in teacher preparation programs. The release of the TETCs provides future research opportunities including, but not limited to, implications for course design, relevant faculty development for teacher educators, and policy implications. Foulger, T.S., Graziano, K.J., Schmidt-Crawford, D. & Slykhuis, D.A. (2017). Teacher Educator Technology Competencies. Journal of Technology and Teacher Education, 25 (4), 413-448. Waynesville, NC USA: Society for Information Technology & Teacher Education. Retrieved April 19, 2019 from https://www.learntechlib.org/primary/p/181966/. Agyei, D.D., & Voogt, J.M. (2011). Exploring the potential of the will, skill, tool model in Ghana: predicting prospective and practicing teachers’ use of technology. Computers& Education, 56, 91–100. Angeli, C., & Valanides, N. (2009). Epistemological and methodological issues for the conceptualization, development, and assessment of ICT–TPCK: Advances in technological pedagogical content knowledge (TPCK). Computers& Education, 52(1), 154-168. Association of Mathematics Teacher Educators. (2017). Standards for preparing teachers of mathematics. Retrieved from https://amte.net/standards Barton, R., & Haydn, T. (2006). Trainee teachers’ views on what helps them to use information and communication technology effectively in their subject teaching. Journal of Computer Assisted Learning, 22, 257–272. Borthwick, A.C., & Hansen, R. (2017). Digital Literacy in Teacher Education: Are Teacher Educators Competent? Journal of Digital Learning in Teacher Education, 33(2), 46-48. Dexter, S., Doering, A.H., & Riedel, E.S. (2006). Content area specific technology integration: A model for educating teachers. Journal of Technology and Teacher Education, 14(2), 325. Drent, M., & Meelissen, M. (2008). Which factors obstruct or stimulate teacher educators to use ICT innovatively? Computers& Education, 51, 187–199. Ertmer, P.A., & Ottenbreit-Leftwich, A.T. (2010). Teacher technology change: How knowledge, confidence, beliefs, and culture intersect. Journal of Research on Technology in Education, 42(3), 255-284. Foulger, T.S., Buss, R.R., Wetzel, K., & Lindsey, L. (2012). Preservice teacher education benchmarking a standalone ed tech course in preparation for change. Journal of Digital Learning in Teacher Education, 29(2), 48-58. Foulger, T.S., Gerard, M. (2009, July). Making the ideal real: Reciprocal mentoring for technology integration in preservice education. Paper presented at the International Society for Technology in Education’s National Educational Computing Conference, Washington, D.C.
Gamrat, C., Zimmerman, H.T., Dudek. J., & Peck, K. (2014). Personalized workplace learning: An exploratory study on digital badging within a teacher professional development program. British Journal of Educational Technology, 45(6), 1136-1148. Goktas, Y., Yildirim, S., & Yildirim, Z. (2009). Main barriers and possible enablers of ICTs integration into pre-service teacher education programs. Educational Technology& Society, 12(1), 193–204. Graziano, K.J., Herring, M., Carpenter, J., Smaldino, S., Finsness, E. (2017). A TPACK diagnostic tool for teacher education leaders. TechTrends, 61(4), 372-379. Gronseth, S., Brush, T., Ottenbreit-Leftwich, A., Strycker, J., Abaci, S., Easterling, W., & Leusen, P.V. (2010). Equipping the next generation of teachers: Technology preparation and practice. Journal of Digital Learning in Teacher Education, 27(1), 30-36. Hallinger, P. (2010). Leading educational change: reflections on the practice of instructional and transformational leadership. In A. Walker& P. Hallinger (Eds. ), Gateways to leading learning: leading educational change (pp. 2–37). Hong Kong: Hong Kong Institute of Education. Hammond, T.C., & Manfra, M.M. (2009). Giving, prompting, making: Aligning technology and pedagogy within TPACK for social studies instruction. Contemporary Issues in Technology and Teacher Education, 9(2), 160-185. Harris, J., & Hofer, M.J. (2009). Instructional planning activity types as vehicles for curriculum-based TPACK development. Society for Information Technology and Teacher Education. Hutchison, A. & Colwell, J. (2015). Bridging Technology and Literacy: Developing Digital Reading and Writing Practices in Grades K-6. New York: Rowman & Littlefield. Kisicki, T. (2012). Comparing Graduate Courses Taught By The Same Instructor Using Competing Approaches: Traditional Vs. Technology-Infused. Arizona State University. Kleiner, B., Thomas, N., & Lewis, L. (2007). Educational technology in teacher education programs for initial licensure. Statistical Analysis Report. NCES 2008-040. National Center for Education Statistics. Koster, B., Brekelmans, M., Korthagen, F., & Wubbels, T. (2005). Quality requirements for teacher educators. Teaching and Teacher Education, 21, 157-176. Leithwood, K, Begley, P.T, & Cousins, J.B. (1994). Developing expert leadership for future schools. London: Falmer. Linstone, H.A., & Turoff, M. (2002). The Delphi method: Techniques and applications. Newark, NJ: New Jersey Institute of Technology. Retrieved from web.njit.edu/~turoff/pubs/delphibook/delphibook.pdf. Niess, M.L. (2011). Investigating TPACK: Knowledge growth in teaching with technology. Journal of Educational Computing Research, 44(3), 299-317. Nworie, J. (2011). Using the Delphi technique in educational technology research. TechTrends, 55(5), 24-30. Polly, D., Mims, C., Shepherd, C.E., & Inan, F. (2010). Evidence of impact: transforming teacher education with preparing tomorrow’s teachers to teach with technology (PT3) grants. Teaching and Teacher Education, 26, 863– 870. Sang, G., Valcke, M., van Braak, J., & Tondeur, J. (2010). Student teachers’ thinking processes and ICT integration: Predictors of prospective teaching behaviors with educational technology. Computers& Education, 54(1), 103-112. Shettel, J.W., & Bower, K. (2013). Infusing technology into the balanced literacy classroom. E-Journal of Balanced Reading Instruction, 1(2), 3-11. Skulmoski, G.J., Hartman, F.T., & Krahn, J. (2007). The Delphi method for graduate research. 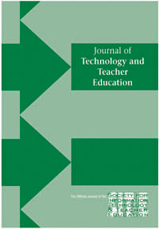 Journal of Information Technology Education, 6, 1-21. Thomas, L.G., & Knezek, D.G. (2008). Information, communications, and educational technology standards for students, teachers, and school leaders. International Handbook of Information Technology in Primary and Secondary Education, 333-348. Thomas, T., Herring, M., Redmond, P., & Smaldino, S. (2013). Leading change and innovation in teacher preparation: A blueprint for developing TPACK ready teacher candidates. TechTrends, 57(5), 55-63. Thompson, A.D., Schmidt, D.A., & Davis, N.E. (2003). Technology collaboratives for simultaneous renewal in teacher education. Educational Technology Research and Development, 51(1), 73-89. Tondeur, J., van Braak, J., Sang, G., Voogt, J., Fisser, P., & Ottenbreit-Leftwich, A. (2012). Preparing pre-service teachers to integrate technology in education: A synthesis of qualitative evidence. Computers& Education, 59(1), 134-144. Tondeur, J., Roblin, N.P., van Braak, J., Fisser, P., & Voogt, J. (2013). Technological pedagogical content knowledge in teacher education: In search of a new curriculum. Educational Studies, 39(2), 239-243. University of Texas School of Public Health (2012). Competencies and learning objectives. Retrieved from https://sph.uth.edu/content/uploads/2012/01/ Competencies-and-Learning-Objectives.pdf on September 4, 2016. Voogt, J., Fisser, P., Pareja Roblin, N., Tondeur, J., & Van Braak, J. (2012). Technological pedagogical content knowledge–a review of the literature. Journal of Computer Assisted Learning, 29(2), 109-121. Wetzel, K., Buss, R., Foulger, T.S., & Lindsey, L. (2014). Infusing educational technology in teaching methods courses: Successes and dilemmas. Journal of Digital Learning in Teacher Education, 30(3), 89-103. Teacher Educator Technology CompetenciesFoulger, T.S., Ewbank, A.D., Kay, A., Osborn Popp, S., & Carter, H.L. (2009). Moral spaces in MySpace: Preservice teachers’ perspectives about ethical issues in social networking. Journal of Research on Technology in Education, 42(1), 1-28. Teacher Educator Technology Competenciesreitt-Leftwich, A. (2012), Preparing pre-service teachers to integrate technology in education: A synthesis of qualitative evidence. Computers& Education, 59(1), 134-144.